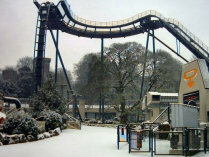 More snowfall overnight has resulted in the closure of the theme park for the weekend. Alton Towers confirmed Saturday's closure on Twitter this morning, whilst the decision to close on Sunday was made shortly after 2pm. Yesterday, staff that were able to access the resort cleaned paths and made the park safe in the hope that they would be able to allow guests to enjoy a day out today. However conditions have deteriorated since then. Alton Towers have again updated their weather updates page to apologise and provide information for guests who have pre-booked tickets or hotel stays. The park does hope to reopen on Monday 25th March, but please continue to check for updates by Alton Towers on their website, Facebook and Twitter pages. Make your way from the back of the park to the front - against the general flow.